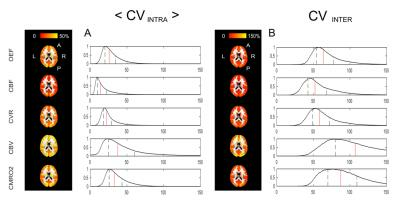 This study introduces a novel hybrid methodology for DBS-fMRI research. 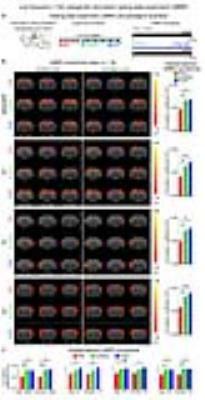 Our findings demonstrate robust stimulus evoked fMRI and fcMRI responses during STN-DBS, which should shed light on how DBS exerts its therapeutic effects on whole-brain functional networks and delineate a road-map for future optimization of DBS therapy to enhance outcomes and reduce side-effects. We quantified neural activity using a novel method for simultaneous acquisition of blood-oxygenationlevel dependent (BOLD)-fMRI signals and proton magnetic resonance spectroscopy (1H -MRS)-MRI at 7 Tesla. 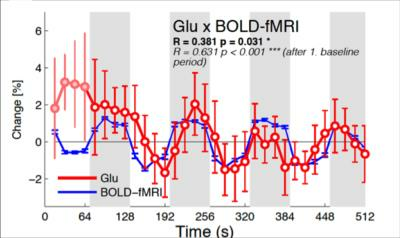 We have demonstrated the correlation of glutamate, the principal excitatory neurotransmitter in the nervous system, with BOLD-fMRI responses during brief (64 s) periods of visual stimulation. These results establish the feasibility of concurrent measurements of BOLD-fMRI and neurochemicals at a temporal resolution compatible with human fMRI studies. This study observes dynamic functional connectivity changes in an elderly AD-risk population mediated by both regional Aß-deposits and GABA levels, using PiB-PET and MRSI. The sample is grouped into subjects with high regional Aß and high GABA, and changes in dynamic network expression are compared between groups. Our preliminary findings show dynamic network changes specific to high Aß-deposits in the neocortex and the frontal and temporal lobe. This indicates region-specific network changes that may in part explain the weak correlation between global Aß and AD progression. 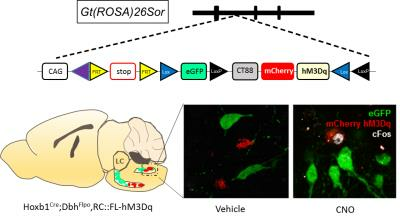 In this study, we show that chemogenetic fMRI and 18 F FDG PET can sensitively dissect the functional neurocircuits of noradrenergic cells derived from rhombomere 4 expressing Hoxb1 during neurodevelopment. To address this, we used a novel genetically engineered mouse line expressing Designer Receptors Exclusively Activated for Designer Drugs (DREADD) in Hoxb1-derived noradrenargic neurons in several subpopulations throughout the pons and medulla. For the first time, we used ICA-based fMRI analaysis to dissect the complex polysynaptic pathways associated with chemogenetic modulation of Hoxb-1 derived noradrenargic neurons. The hippocampus, including dorsal dentate gyrus (dDG), and cortex engage in bidirectional communication. We propose that low frequency activities in hippocampal-cortical pathway underlie brain-wide resting-state fMRI (rsfMRI) connectivity to mediate distinct cognitive functions and integrate sensory information. 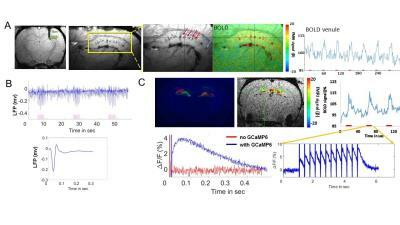 Using optogenetics and fMRI, we determined large-scale spatiotemporal specific hippocampal-cortical activity. 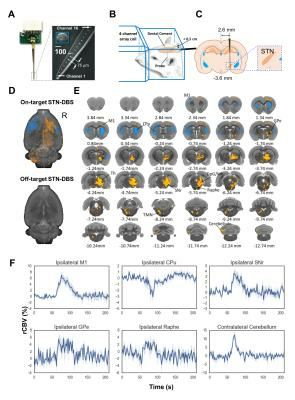 Low, but not high, frequency optogenetic stimulation of dDG excitatory neurons evoked robust cortical and subcortical responses, and enhanced interhemispheric hippocampal and cortical rsfMRI connectivity. In addition, pharmacological inactivation of dDG decreased rsfMRI connectivity. These findings directly indicate that low frequency activity propagates in hippocampal-cortical pathway and contributes to brain-wide rsfMRI connectivity. Optogenetics and fMRI were combined to examine the neural activity underlying the rewarding behavior mediated by the medial prefrontal cortex (MPFC) in rats. Animals were trained to press lever for optogenetic self-administration in MPFC. FMRI showed that MPFC photostimulation activated many regions known to receive MPFC afferents. Notably, the activation of hypothalamus, agranular insula, and ventral striatum was positively correlated with the lever press. Our finding may shed light on brain circuits involved in therapeutic effects of recent deep brain stimulation studies in major depression, in which the MPFC plays an important role. Previously, we have developed a single-vessel fMRI method to visualize the hemodynamic signal propagation from individual venules and arterioles in the deep layer cortex and hippocampus. Here, we combined the single-vessel SSFP-fMRI with the GCaMP-mediated calcium recording to decipher the hippocampal neurovascular coupling events. Optogenetic stimulation led to epileptic activity, which could be detected as the bursting calcium spikes coupled to elongated fMRI signal from individual hippocampal arterioles and venules up to 20-30s following the epileptic events. This work establishes a multi-modal fMRI platform to characterize the hippocampal vascular dynamics of both normal and optogenetically driven seizure-like states. Identifying the genetic and molecular factors regulating the development and the dynamics of brain functional connectivity (FC) networks in health and disease is important to develop novel therapeutic strategies. Resting state functional magnetic resonance imaging (rsfMRI) can reveal the FC remodeling in psychiatric disorders and drug addiction. Emerging studies suggest that neuronal responses to alcohol involve several G protein-coupled receptors (GPCR)-mediated signaling pathways, inducing short-term to long-term changes in behavioral and neuronal plasticity. This study investigates the role of GPR88 in the acquisition and development of alcohol dependence and unravels the rsFC modifications underpinning this processes in the mouse brain. Connectivity of prefrontal cortex was studied with electrical microstimulation and fMRI in the macaque. O2 metabolism is a crucial biomarker of brain physiology. We aim at measuring the repeatability of estimates of O2 metabolism obtained with a dual calibrated fMRI experiment and a newly proposed parameter estimation approach based on a forward model. The analysis is carried out on two datasets from volunteers scanned at rest. The performances are shown to depend on the physiological parameter considered, resolution (bulk or voxel-wise level) and decreasing from within- to between-sessions repeatability. Overall the repeatability is demonstrated to be comparable with PET and a previous calibrated fMRI method, but supplying a more complete mapping of brain O2 metabolism.